Using the right special effect can make your video match your creative vision. Whether it’s simply tinting a shot to fit a mood, creating an old-fashioned film look, or turning a video clip into an abstract animated background, the right video effect is just a click away. If you’ve been using iMovie to edit your videos, you may have found that its effects are useful but limited: There are only 20 to choose from, you can use just one at a time, and you can’t modify them at all. Final Cut Pro X on the other hand includes a huge variety of effects that you can modify and combine to create just about any look you can imagine. And since you can easily import your iMovie project into Final Cut Pro, it’s a straightforward way to expand your creative options. To preview an effect in Final Cut Pro X, first move the playhead over the clip you want to see the effect applied to so that it appears in the Viewer. Select the clip. Then open the Effects Browser by clicking its button in the Toolbar or pressing Command-5. The Effects Browser in Final Cut Pro X. Here, you’ll find more than 130 video effects, including the 20 from iMovie, organized into eight categories (audio effects are located here as well). 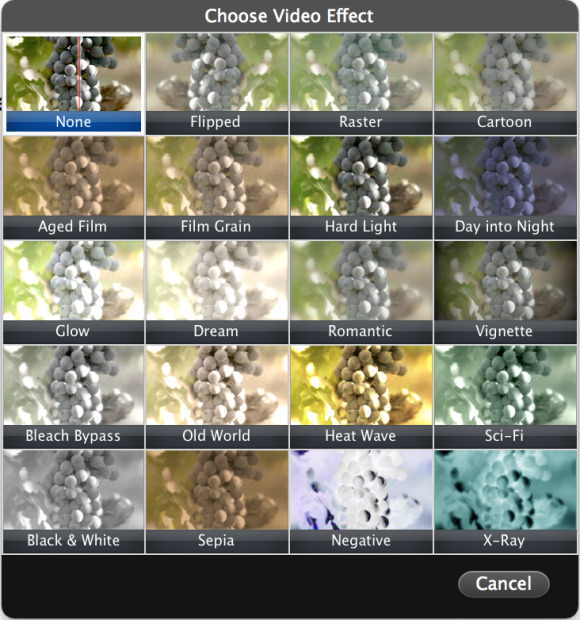 These effects run the gamut from simple color tints to complex animations. The thumbnails show what the default settings of each effect look like when applied to a placeholder image. By skimming the pointer over a thumbnail, the placeholder image is replaced with the frame under the playhead so that you can see the effect on your own clip. Even better, the effect appears full size in the Viewer. 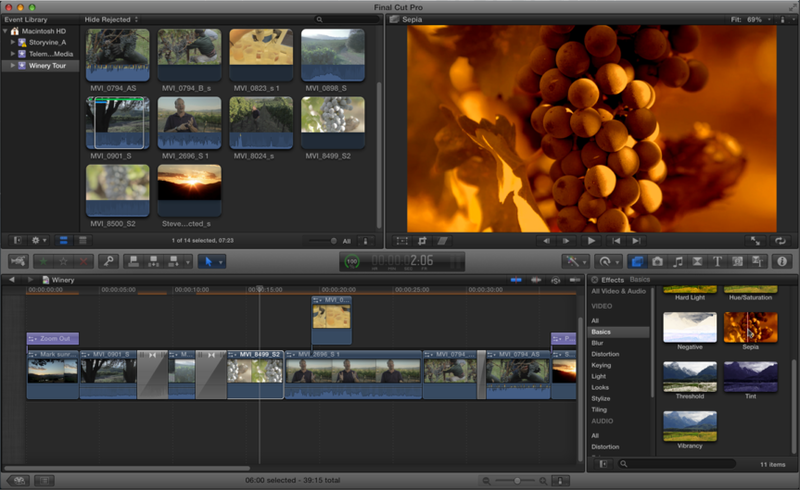 Previewing the Sepia effect in Final Cut Pro X. Both the thumbnail and the Viewer show how the default settings of the effect look on the playhead frame. Once you’ve located an effect you want to use, double-clicking the thumbnail applies the effect to the selected clip. If you have multiple clips selected, this action will apply the effect to all of them. If you apply effects in iMovie, at this point you're done: What you see is what you get. But with Final Cut Pro X, you’re just getting started. Every effect has parameters that you can adjust to change how it looks—sometimes quite dramatically. If you applied the Sepia effect in iMovie, you can change how it looks in Final Cut Pro X. Another useful effect is Gaussian, located in the Blur category. This effect is great for when you have a title over a video clip: By blurring the video, you bring more attention to the title. With the Gaussian Blur effect, you can adjust the amount of blur. You can even adjust the horizontal and vertical blur amounts independently. Crop & Feather is an effect I use often; it’s located in the Distortion category. This effect is great for situations where you want your clip to appear over a background. The Crop & Feather effect applied to a video clip that has the Fabric generator connected beneath it. Here’s a tip: if you drag the Roundness slider right, you can’t go beyond a value of 50. But if you drag directly on the value field itself, you can go much higher. This handy little cheat works for many other parameters as well. These examples are useful but not especially dramatic. Some effects, however, can radically alter the clip they are applied to. Try the effects in the Tiling category, for example. The Kaleidoscope effect from the Tiling category includes several on-screen controls for adjusting the Center, the Offset Angle, and the Segment Angle directly in the Viewer. Some effects are animated when you apply them (check out Earthquake in the Distortion category); others you can animate yourself by setting keyframes. In Final Cut Pro X, you can add as many different effects to a clip as you like. By stacking effects and adjusting their parameters, you can create unique looks. The Sketch, Spot, Photo Recall, and Super 8mm effects all applied to a clip. The order that you apply your effects can change the result; in the Inspector, drag effects up or down to reorder them. If the 103-plus included effects aren’t enough, you can find many free or inexpensive effects to add to your collection. In fact, you can download a bunch of useful effects that I created for free. You can even make your own custom effects with Motion! 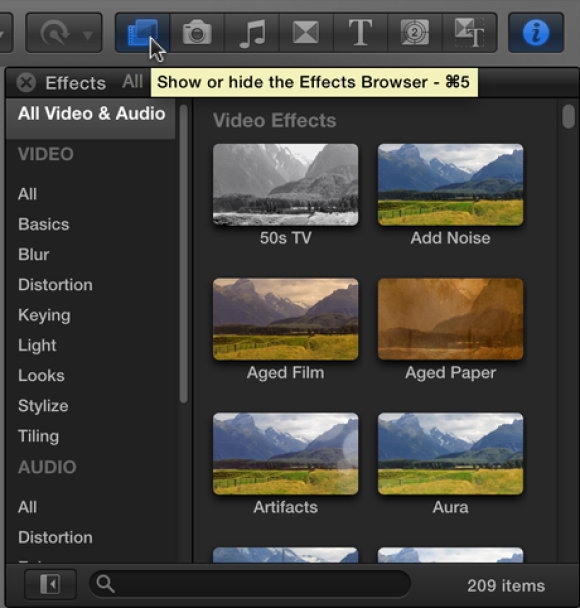 Effects in Final Cut Pro X are diverse, easy to use, and highly customizable. I recommend taking some time to peruse all of them—the next time you need a looking-through-a-rainy-window effect, you’ll know you’ve got it covered!